Starswept by Mary Fan. Snowy Wings Publishing, 2017. 400 pages. I honestly had no idea what to expect from Starswept, but overall iI was so impressed by how well-crafted this book was. The basic premise of Starswept itself was actually rather interesting. This book takes place in a futuristic setting-- 2157, to be exact--in which an advanced race of humans known as the Adryil have made contact with Earth. This advanced society has developed a somewhat symbiotic relationship with Earth in which it basically hires out talented artists, musicians, singers, dancers, etc. to come to their planet to entertain the Adryil. This is where Iris and the rest of the story enters the picture, as Iris is currently a student at Papilio, a prestigious performing arts school on Earth. It is also worth noting that the advanced technology of the Adryil is used on Earth and specifically at Papilio. I first want to remark upon how impressed I was with the basic worldbuilding in this book. I'm not usually a big reader of futuristic types of setting, but I found that Fan did a really great job of creating a world that was realistic, but also still unique and different enough to really feel like a different setting. The one issue I had, however, was that this worldbuilding wasn't quite as expansive as I would have liked. Since the story in this book only takes place in one part of the United States, I didn't really understand what the rest of the world was like. I think it was touched upon a few times, but nothing very in depth or in a way that gave me an overall feel, so I did feel somewhat lost in this world when I tried to think of the bigger picture. Perhaps the sequel will expand in this area more. The characters were well-written overall, although I did find Iris a bit naive at times. I felt frustrated with how trusting and stubborn she was about listening to what other people told her. However, I also can somewhat understand why Iris was naive based upon the circumstances around how she was raised, so therefore I'm not sure if this is something that I can really fault Fan with--I'm really just conflicted. All I do know is that it was a bit frustrating at times. What I thought Fan did really well, however, was craft well-rounded characters. Just about every prominent character, good or bad, was written with real depth to their personality that allowed you to see that they aren't just one shade. There is some romance in this book that does play a pretty large role, but at the same time... it wasn't overly prominent? I feel like this book would have worked well with or without a romantic aspect, but this romance actually worked. It didn't feel too sudden or unimaginable, but instead seemed to fall into place in a very timely manner that felt more natural to me. I really appreciated that aspect. 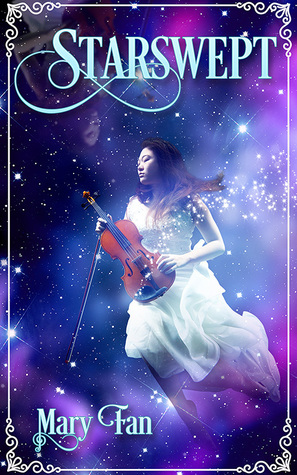 The strongest point in Starswept was by far Fan's portrayal and descriptions of Iris playing her viola. It is apparent that Fan herself is a musician who understands the passions for music and how it can be so emotionally affecting to those that love it. Iris' passion for what she does is readily apparent and a joy to read. On a less positive note, however, I felt like this book was just too long. There were one too many places in which I found myself getting bored and wishing the plot would just move along. I think Fan could have edited out more than a few scenes and areas in which nothing was really added to the book. That being said, the areas that were interesting were really well-written and very enjoyable. Overall, I've given Starswept three-and-a-half stars! I'd definitely recommend this to anyone looking for an interesting story with revolutionary tones. I've never heard of this book before, but I am glad you liked it :) Thanks for sharing!